Mission: The commission shall reflect the interests, history, and importance of the communities along Route 66 in Missouri. Function: The commission shall: plan and sponsor official Route 66 centennial events, programs, and activities in the state; encourage the development of programs designed to involve all citizens in activities that commemorate Route 66 centennial events 53 in the state; and to the best of the commission's ability, make available to the public information on Route 66 centennial events happening throughout the state. Term length: The commission shall be dissolved on June 30, 2027. Compensation: A public member is entitled to reimbursement for the travel expenses incurred by the member while transacting commission business. 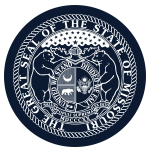 Member Requirements: The commission shall be composed of eighteen members who reflect the interests, history, and importance of the communities along Route 66 in Missouri. The members shall be appointed as follows: (1) Two public members appointed by the speaker of the house of representatives; (2) Two public members appointed by the minority leader of the house of representatives; (3) Two public members appointed by the president pro tempore of the senate; (4) Two public members appointed by the minority leader of the senate; (5) Three public members appointed by the governor, one of whom shall serve as chairperson; and (6) Seven ex officio members as follows: (a) The governor, or his or her designee; (b) The director of the department of transportation, or his or her designee; (c) The director of the department of natural resources, or his or her designee; (d) The director of the division of tourism, or his or her designee; (e) The director of the department of economic development, or his or her designee; (f) The secretary of state, or his or her designee; and (g) The president of the Route 66 Association of Missouri, or his or her designee.